Candlelighters is a local, not-for-profit volunteer organization that provide programs and services to young cancer patients, and their families, receiving treatment in the National Capital Region. 65 children will be diagnosed with cancer this year in the National Capital Region. Membership in Candlelighters is through hospital referral. To enrich the lives of children, and their families, coping with childhood cancer and promote awareness and understanding of the impact of childhood cancer on their lives. 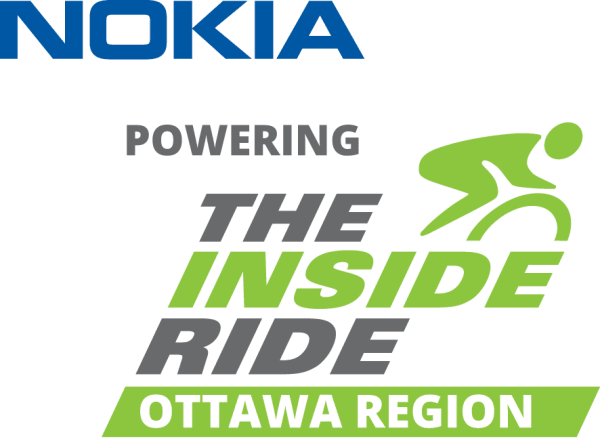 Nokia Powering the Inside Ride is a partnership between Coast to Coast Against Cancer Foundation and Nokia committed to making a difference in the lives of kids and families living with childhood cancer in the Ottawa region. As partners we have set our sites on raising $1 million in 5 years between 2016 & 2020. In our first year five local events, Nokia’s own supersized campus event and 4 local schools, came together successfully raised $168,000.00. In 2017, our sophomore year, $237,000.00 was raised. 100% of those funds have been donated to Candlelighters Ottawa, a grassroots charity that provides support programs and services to young cancer patients and their families in the Ottawa area. Some of the programs offered by Candlelighters include; The CyberKids program, Hospital Support, Parking Program, Financial Support and a Bereavement Support Group. 2018 marks the 11th year of the partnership. Coast to Coast Against Cancer Foundation and Nokia have renewed their commitment to Candlelighters, continuing our agreement to have all Ottawa region Academic Inside Ride events fund Candlelighters. Nokia and Coast to Coast encourage Ottawa area schools to join them by hosting their own event in support of this amazing local organization.